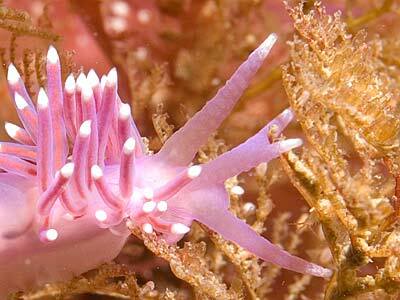 Description: This nudibranch is easily recognised by the overall pink-purple coloration of the body and processes. Opaque white pigment is present on the extremities and as white rings at the tips of the cerata. The digestive gland is usually red in colour, partly masked by the purple hue. Typically about 20mm in length. 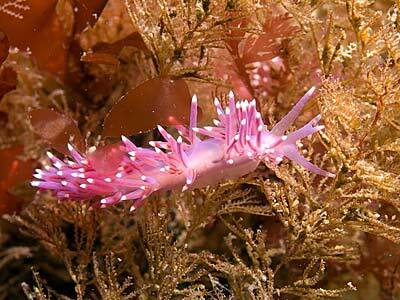 Habitat: Found usually in ones or twos in moderately exposed rocky sublittoral areas. The food is a sparsely-branched, spindly species of Eudendrium which has not yet been identified. The spawn is a thin white thread normally wound round the Eudendrium on which the animals are feeding. Distribution: Common and widespread but rarely abundant, all round the British Isles and south to the Mediterranean Sea. Similar Species: Structurally similar to other Flabellinids, but distinguished by its purple hue. 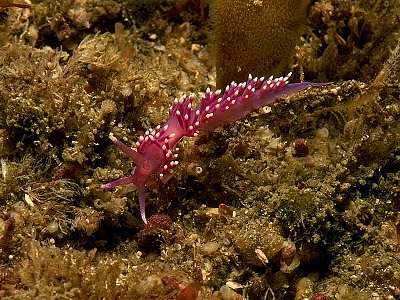 Flabellina affinis shares this coloration, but has lamellate rhinophores and more pedunculate cerata and is found in the Mediterranean Sea, but not further north. Cerata in bunches and joined at their bases. Picton, B.E. & Morrow, C.C. (2016). Edmundsella pedata (Montagu, 1815). [In] Encyclopedia of Marine Life of Britain and Ireland.